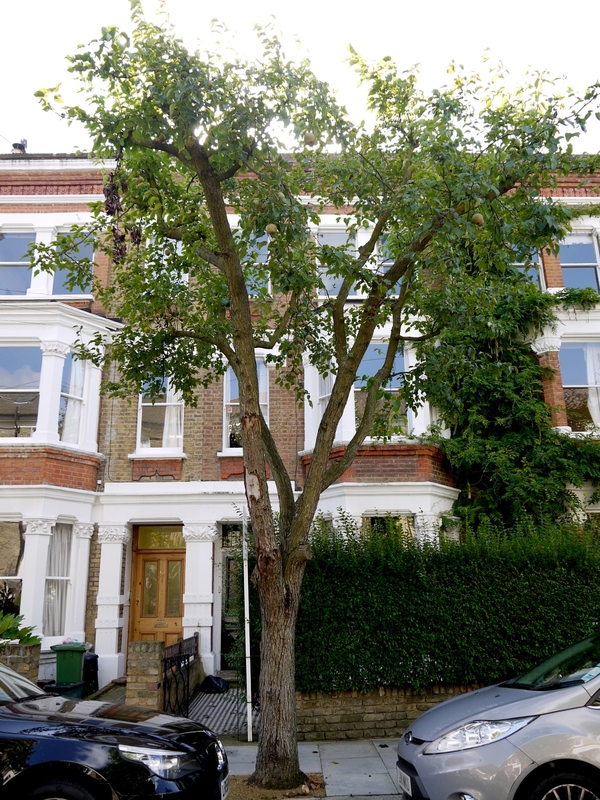 Not far from Archway tube station, just off the Holloway Road is a street named St. John’s Villas lined with imposing early Victorian houses on one side and a later, more run-of-the-mill terrace on the other. The street is a cut off Holloway Road heading towards Hornsey Road and like many 19th century city streets follows earlier land boundaries now long-forgotten. The street is remarkable for its handsome and unusual Sand pears (Pyrus pyrifolia). I first noticed the trees and their unusually large russet-apple type fruits in 2007 when a huge crop fell on resident’s Volvos and a slippery pomaceous pulp started fermenting on the pavements and in the gutters. This rare fruit event excited the residents in to opposing camps of those who wanted the council to fell the offending and potentially deadly trees, and those who saw the crop as something to be cherished. This quintessentially English middle-class story of tree-hugging north Londoners was soon picked up by the august organ that is the Daily Mail who lapped it up and spat out an over-weaning local council health and safety scare story. Four years later and the trees are thankfully still there. Now the council picks the fruit each autumn (not since 2007 in such abundance) and local residents make use of them. Apparently one group has even made Perry (like ‘Pear cider’, but not sold in Tesco and made with pears). I went to check on the crop this past weekend and a local casually asked if I was interested in the pears – I was obviously not the first to make the pilgrimage to St. John’s Villas. There are seven pear trees that were pruned in the spring so this year’s crop is minimal but is ripening nicely. The fruits are large and will be ready within weeks – I shall be looking out for the looming Islington council pear bounty. The trees make me wonder. They were obviously planted on the street several decades ago – they are perhaps 50 years old but why was this (unidentified) variety chosen? Who planted them? There are pear trees used as street trees elsewhere locally (with spectacular spring blossom) but not this rare species. I like the theory put forward by the resident I got chatting to: before the houses were built the area was orchards, and so perhaps these trees are directly descended from an old and now rare variety once common in these market gardens providing Londoners with a refreshing and unusual brew. There are many unanswered questions, not least how these trees got here and I hope, before the controversial trees disappear, cuttings are grafted onto young roots so the strange fruit will continue to fall for generations. 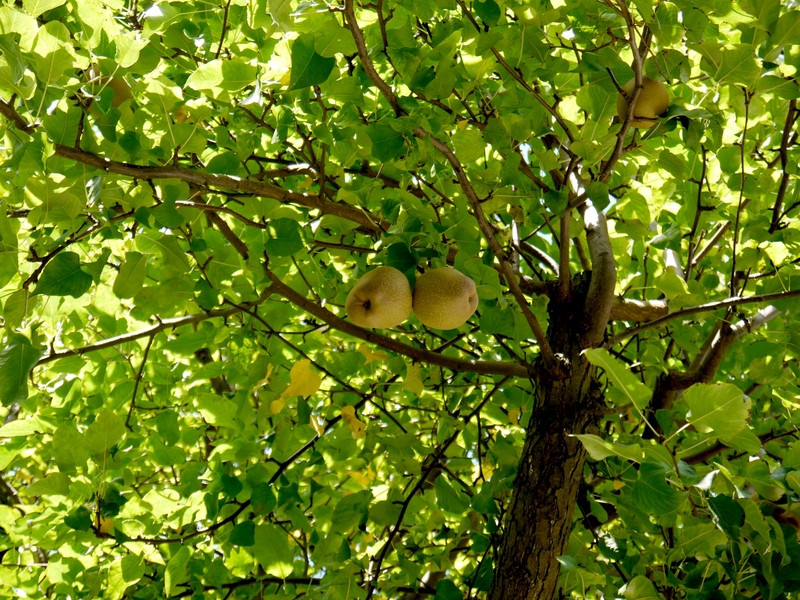 Check out the for sale signs – pear trees a factor in house prices?